As an exercise, imagine that you have been asked to express some of your innermost feelings, admit to mistakes that you’ve made in your life, and pledge changes that you’ll make from this day forward – all in public. This is precisely what occurred for the students at Valley High School this past Tuesday. Valley High is the alternative high school in the Dublin Unified School District. Valley High provides a supportive and constructive environment for students that are striving to complete their high school education in a setting that differs from Dublin High School. OneDublin.org had the privilege to attend the previous edition of Challenge Day earlier this year, and was invited back by Counselor Liz Buckley. At VHS, a conscious decision was made to move up this event in the calendar so that the benefits from the program could provide a positive impact throughout the remainder of the school year. As with any externally provided program, the event is not free. Funding for Challenge Day came as a result of grant requests that were written by the Dublin Partners in Education (DPIE). As in previous years, the primary benefactors were Kaiser Permanente and the Palo Alto Medical Foundation. The presentation is also not possible without the assistance of volunteer facilitators consisting of Valley High staff, parents, community members and DPIE staff. On Tuesday, the primary facilitators from Challenge Day were Randy Fortes and Jolana Hertz-Bishay. 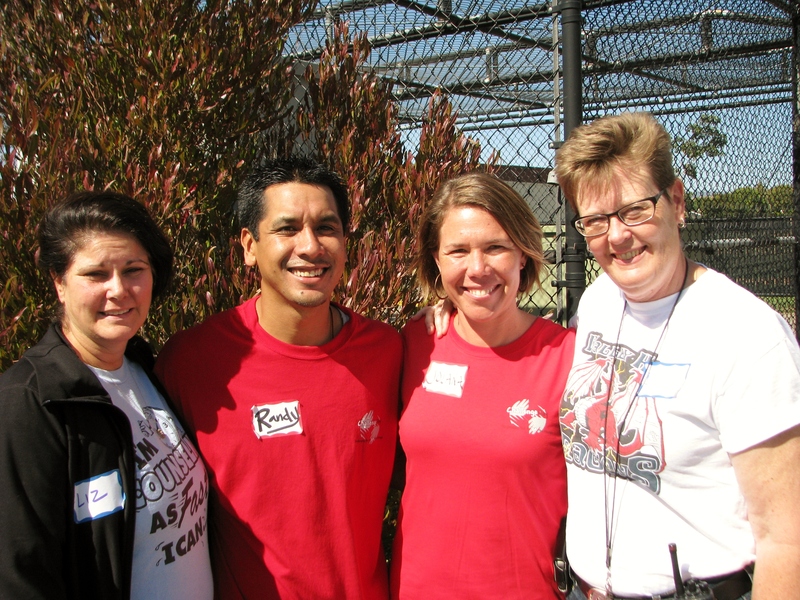 Mr. Fortes is a Livermore native and has worked with Challenge Day for seven years. Ms. Bishay is from Southern CA and had previously worked with the organization for five years. She recently took a break to raise her children and her visit to Valley was her first day back at work. As we had previously observed, the facilitators are a key ingredient to a successful day. It requires tremendous stamina, excellent listening skills and overflowing enthusiasm. This was certainly the case with both Randy and Jolana. The day begins: The entire student body is welcomed into the Valley High gym with music blaring through mounted loudspeakers and an eager group of co-facilitators. 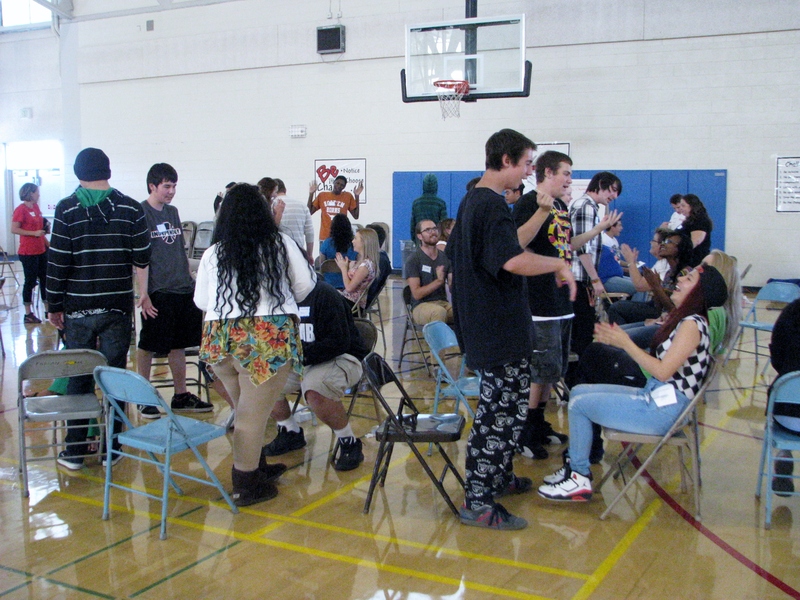 All of the students take a seat in folding chairs that had been pre-arranged into a circle. Randy and Jolana each take turns at the microphone and try to give the participants an inkling of what the day may include. Mr. Fortes encouraged the crowd to “let go”, “be honest” and to ultimately “be the change.” Ms. Bishay asked the students to dream about the school that they wanted Valley to become and to fantasize about the life that they would like to lead. From there, the entire group went on to engage in group and individualized exercises designed to remove any apprehensions and to promote looking at one’s own life – whether through positive or negative experiences. At the conclusion of the day, we were able to garner some feedback from Randy and Jolana. OneDublin.org: Do you ever walk into a school with preconceived notions about it or do you receive information about the school body? Or do you just see what you have and then modify? OneDublin.org: While you are spending one full day with this student body, you may never see them again. How do you know that this program has had a positive impact on the students once you depart? OneDublin.org: As we’ve witnessed, Challenge Day can be a very emotionally exhausting day for the participants. Can we presume that it affects you as well and how do you “come down” from the intense experience? As we mentioned in the prelude, it takes a lot of courage and trust to actively participate in this type of forum. One of the afternoon exercises was to “Cross the Line.” This requires individuals to share some of their darkest moments and to acknowledge their existence. But as a growth step, the individual must proclaim how they will overcome this obstacle and to take their life in a more positive direction. Among other activities, the students are asked to openly discuss a message that they would like to convey to someone that is no longer in their lives – regardless of circumstance. As you might imagine, the day is filled with introspection, some tears and many, many hugs. To round out our story, we approached Principal Rinda Bartley to share her views on the day. OneDublin.org: Last year’s Challenge Day occurred in the spring. This year it was executed in early fall. Was there a reason for this? OneDublin.org: You mentioned that you needed to tend to school business that directed you to leave for a short period of time in the middle of the session. However, you noticed a difference in the students’ behavior/attitude when you re-entered. Please explain. OneDublin.org: The successful presentation of this program at Valley High is largely due to financial assistance provided by DPIE – more specifically to Kaiser Permanente and the Palo Alto Medical Foundation. What would you like to express to these organizations and how has the program positively affected your site? Bartley: We, at Valley High, are deeply grateful to DPIE, Kaiser and the PA Medical Foundation for their understanding of our students and their willingness to fund this important experience. Of course, the day is only as valuable as the follow-up that we provide to students day-to-day and that we pledge to do the best of our ability. Again, thanks. Your generous gift makes a tremendous difference to our students. At times, the language may have been a bit rough and some emotions were a little raw. But we are figuring that what the students experienced at Valley High School will stay with them for the next several years. OneDublin.org applauds both VHS and DPIE for supporting this very powerful and beneficial program.